When I first tried Gardein’s fishless filets the other day, I wanted to put my plate down and give them a standing O. They were that good. Gardein absolutely nailed it with their vegan recipe that replicates fish sticks. Which, by the way, I cannot say fish sticks without thinking of that South Park episode (click on the image below to watch the clip, and if you have time, I highly suggest watching the entire episode). I know, I’m an immature teenager at heart. 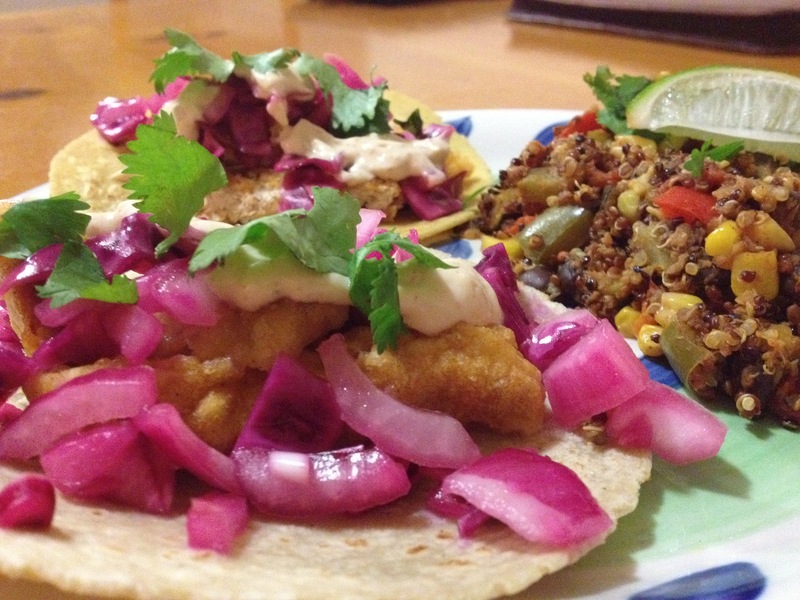 Anyway, when I tried out the fishless filets, I thought about how I could make fish tacos out of them – a dish I was obsessed with before I became vegan. 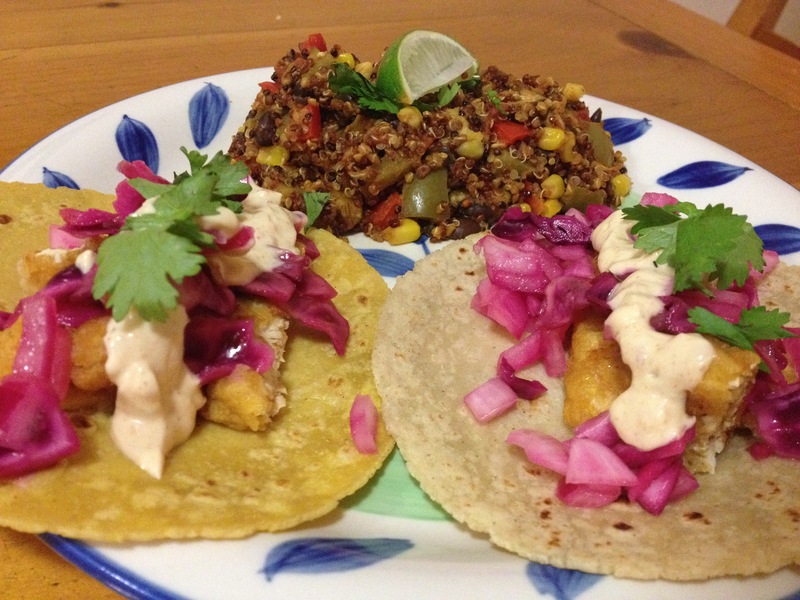 I scoured the internet to find a recipe that replicated the fish tacos I used to make with slaw on top and a cream sauce. I found a fish taco recipe from the blog Homemade Levity, however I wound up just using the slaw mix recipe because the chipotle cream sauce came out too liquidy for me (possibly because I used a blender and not a food processor to make it). With the slaw mix, I also had to drain the excess liquid before serving. My adapted recipe is below. I also found a fish taco sauce that I veganized and changed the ingredients. My version is below, and the original recipe can be found on the Food.com website. 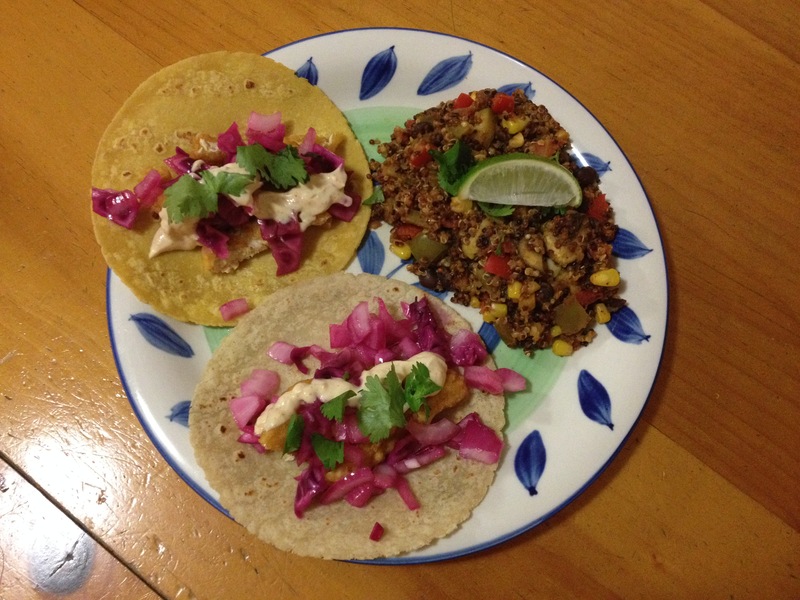 I made the “fish” tacos for our friends the other week, and I paired it with this amazing recipe called One Pan Mexican Quinoa. I added a red and a green bell pepper, summer squash, zucchini, and an onion. It turned out delicious and was super easy to make. I found the Gardein fishless filets at my local King Soopers (part of the Kroger grocery chain for my Atlanta friends and family). So, what are you doing still reading this? Go out and get this product and try them out! You’re welcome. Preheat oven to 425 degrees. Prepare Gardein filets according to package instructions, cooking 10-12 minutes per side. In a small bowl, combine vegan sour cream, vegan mayo, adobo sauce, garlic, lime, and dried spices. Stir until all ingredients are blended. Cut each of the cooked filets in 3-4 lengthwise strips. Warm tortillas in microwave following instructions on package. Place 2-4 filet strips on each of six tortillas. Place two tablespoons of the cabbage mixture and a dollop of the chipotle cream on each of the filets. Top with any of the optional garnishes and serve warm. This recipe was inspired by the blog Homemade Levity. That sounds awesome, Gail! Thanks for sharing! And thanks so much for listening to the show!